It is almost a certainty that the surnames Cruvant/Kruvant/Kruvand/Kruvant come from the Lithuanian town of Krūvandai. We have traced ancestors back to the nearby (5.5 km) town of Čekiškė. One cousin told me that his family lore said the Lithuanian town got its name from the family. Regardless of whether the chicken or egg came first, there is still the unanswered question: What does it mean? I decided to ask on a Lithuanian Genealogy Facebook group. I've learned Krūvandai was founded in the 1600s, and named after a particularly bloody battle in the Polish-Swedish wars (1600-1629). 'Kraujas' means 'blood.' 'Kruvinas' means 'bloody.' This information pretty much sets to rest any question of which came first. Jewish family surnames were uncommon in 17th century Eastern Europe. They weren't required by law until the late 18th, early 19th century, depending upon the area. 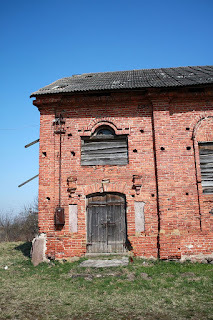 My query on FB did result in an enthusiastic contact fluent in both Lithuanian and English, with current relatives in Krūvandai. In addition to providing me with the information above, he translated from a recent book a chapter on the history of the Jewish community in Čekiškė. A handful of 20th-century cousins of mine were named in the chapter. Sept 4, 1941 marked the violent end of the Jewish community. I also learned that in the Lithuanian language, surnames are gendered. That is, a male cousin might be referred to in documents with the surname 'Kruvandas,' a female cousin either as 'Kruvandaite' or 'Kruvandiene' depending on whether unmarried or married, respectively. 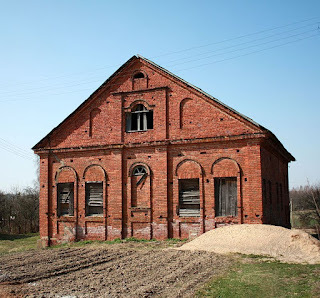 The images are of a synagogue in Čekiškė that still stands. An older synagogue was destroyed in an 1887 fire, and rebuilt. My second great grandfather and his family left in approximately 1886-1887. While they would never have seen the current synagogue, the cousins who remained would have worshipped there for fifty years. How to Pronounce the "G"